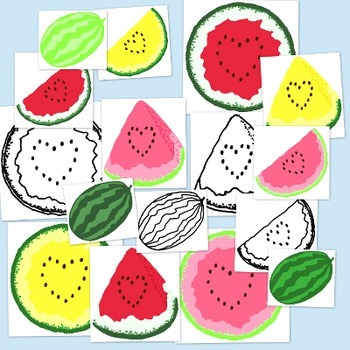 Our 16 piece watermelon clip art bundle features 4 stylized watermelon images in 4 colors each (including black line). That's 16 watermelon themed images in color and black line! 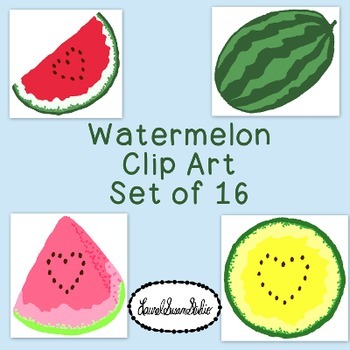 You will receive a zipped folder with 16 watermelon clip art images. For your convenience, we have included each image in two formats - jpg format and png format. Our images are high quality 300 dpi. Due to the size restrictions on preview files, we are not able to show you a close up of everything you will be receiving at full quality. These are my (Susan) original drawings and digitally colored by Laurel.